Michele Mary Smith was born June 21,1967 in Califon. She began playing softball at the age of 5. She was a fan of both the Yankees and Mets, and was particularly fond of shortstop Bucky Dent. By the time Michele began playing for the Voorhees High varsity, she was one of the best young hitters and outfielders in the state. 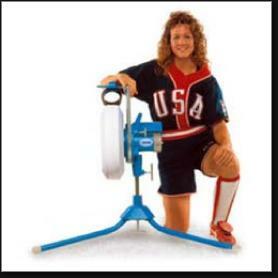 She did not step into the pitcher’s circle until she was 15, when one of her youth-league coaches insisted she do so. Michele’s formidable left arm helped her demolish the records for wins, strikeouts and no-hitters at Voorhees High. Michele was also an outstanding field hockey and basketball player for the Vikings. At a summer softball camp in 1984, Michele was “discovered” by Margaret Rebenar, an assistant to Oklahoma State coach Sandy Fischer. She called Fisher and announced that she had just found the Cowgirls’ next pitcher. Michele considered offers from other schools, including Cal State Fullerton—and a pitch from Air Force, which was more interested in her basketball talent. In 1986, when Michele was 19, she was thrown from a vehicle her father was driving. She was returning from an oral surgery procedure and had fallen asleep listening to a Mets game when the door suddenly opened during a sharp left-hand turn. She suffered muscle and nerve damage to her left arm, and feared her career as a pitcher might be over. However, after nine months of intensive rehab, Michele returned to the Cowgirls and actually was 3 mph faster. In 1989, she pitched Oklahoma State into the College World Series, where the Cowgirls reached the semifinals before bowing out. She graduated in 1990 as a three-time All-Big Eight selected and a two-time All-American. After college, Michele joined the ASA’s Redding Rebels and was named Most Valuable Pitcher in the championship tournament in 1990, ’93, ’94 & ’95. She won gold medals at the 1994 World Championships and the 1995 Pan-Am Games. In 1996, Michele helped Team USA win gold at the Olympics in Atlanta. Four years later, she was on the gold-medal team again, in Australia. She would add two more World golds and another Pan-Am gold in the years that followed. Starting in the early 1990s, Michele started playing softball professionally in Japan. She became one the league’s greatest stars, playing 16 years and leading Team Toyota Shokki to 8 championships. Ironically, by raising the level of play in Japan, Michele may have helped the Japanese women upset Team USA for the gold medal at the 2008 Olympics. As an additional irony, the Olympic Committee had already announced that they would drop women’s softball because the USA was too dominant. Michele got into broadcasting with ESPN, calling the women’s College World Series, and in 2012 she joined Ernie Johnson and John Smoltz in the Atlanta Braves broadcast booth for a game against the Dodgers. It marked the first time a woman had served as a color commentator for a nationally telecast major league game. In 2006, Michele was inducted into the ASA Softball Hall of Fame. She is an ardent campaigner for the return of women’s softball to the Olympic Games. Michele lives in Florida, where she has begun participating in triathlons.